We are nearing the completion of our new website and the launch of our brand Visit Ballard.The Visit Ballard website will be the go-to resource for things to do and services in Ballard. Help us promote our amazing Ballard businesses by adding yours to the site. It is a simple and painless process. Just follow the link in the button below and input your business information. Please provide a photo that exemplifies the essence of your business and attracts customers to you. If you had to set your business apart from your competitors, what high-quality photo would capture your potential customer's/client's attention? Please do not submit logos. You may select multiple categories that apply to your business. For instance, if you are a veterinary clinic that provides dog grooming services, you would click both categories. This will ensure you show up in the appropriate search engine results. We would like to launch our site showcasing as many Ballard businesses as possible so please don't hesitate. However, once the site launches you will have the opportunity to submit. Feel free to share this with your neighbors! If you have any questions or need assistance, please contact Anndrea Dohring at 206-784-9705 extension 2. Meeting and getting to know the diverse and supportive client and local business community we all have. Before we opened our doors in July 2016, my family and I were hoping that clients of all types, ages, and fitness levels would come, and that everyone would support each other. Our dreams have come true, as we have clients ranging from late teens to 70's/80's, women and men, and we constantly cheer each other on. I have been amazed at how generous and kind our neighboring businesses are. We're excited to continue to meet more neighbors and give back wherever we can! We are a healthy lifestyle that is accessible to every body. We merge fitness, nutritional support and a safe community to create strength and balance both inside and outside our studio walls. We deliver a 60 minute workout that is intense - you will feel muscle burn, an endorphin high, and leave with a centered mind. Our team is fully trained to adapt all postures to each individual, whether you have a past or present injury or are training for an event. Our entire team is passionate about what we do and the people who walk through our doors. We will know (and remember!) your name, make sure all questions are answered, and that you are set up for success. Building a strong community was the the number one goal for opening our studio in Ballard. We live what we teach, and are also clients ourselves. Eating and shopping! We love to explore, especially at the consignment store, and to try all the awesome restaurants. My husband Colin, 3.5 yr old daughter Evelyn, and I (and her baby brother, due in August!) meet up in the evenings after I teach class and enjoy a night out in Ballard. Shopping during the Christmas festival and finding unique gifts along Market and Ballard Ave is a particularly great memory. Beds will roll! Human innovation at its finest was demonstrated on Ballard Avenue back in 1970. The Ballard Bed Race was either fun alteration or a fledgling sport for Seattlelites. The Cedar Tavern is no longer a tenant of the Portland Building but who remembers it? You will be dating yourself but that is okay because Ballardites like a good connection to our history. Photo is courtesy of Museum of History and Industry and taken by Bob Miller from the Seattle Post-Intelligencer. Reach your local customers at this year's festival - become a sponsor at any level. Some of our sponsorship packages include access to our VIP lounge and sharing your logo on the Mainstage with up to 75,000 festivalgoers. Entertain clients or reward your hard working employees with a view of the Mainstage, table service and our famous salmon barbecue dinners. 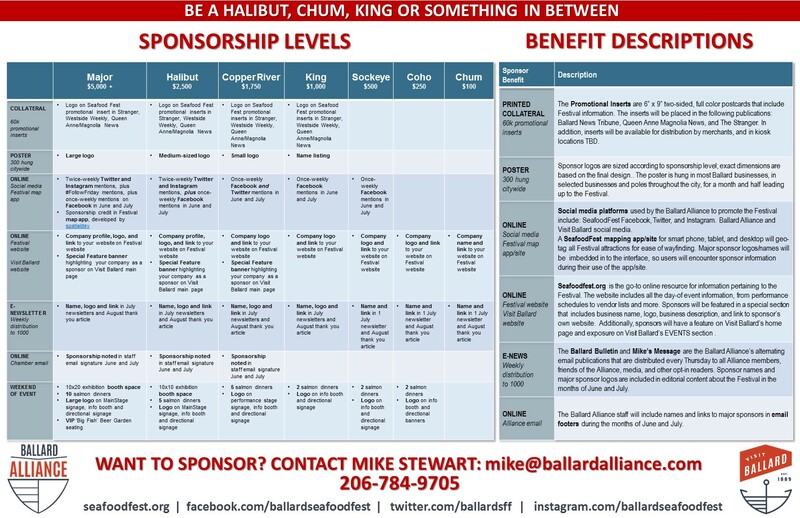 To see a list of what each sponsorship level provides click the fish! SeafoodFest is celebrating 43 years of bringing the community together and this year is set to be the largest gathering to date. Mike Stewart at 206-784-9705 extension 1.